Here’s an extract from a piece I’m writing to further my thesis – an ethnographic account of one of my favourite yoga camps. I’m using this to refine my area of research and start to consider possible field work methodologies. All photos are from the Santosa website, and used for illustrative, commentary purposes. 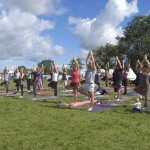 In the corner of a field, within sight of Glastonbury Tor, for ten days at the end of the summer, a hundred to two hundred people gather to share ‘Santosa’: defined here as “the happy acceptance of what is, just as it arises”; at a “living yoga and bhakti camp”. 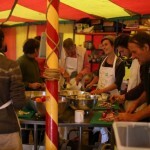 Cars are strictly segregated, but tents and live-in vehicles scatter and merge with more formal camp structures: the carefully-tended block of compost toilets; the busy communal field kitchen; the brightly-coloured geodesic practice domes, and the intricate, interlocking nodes of the ‘Bhakti temple’ yurt. For the last 3 years, I have joined them for a few days, connecting with old friends and new, teaching when needed: a general flow practice here; a family yoga session there; and most days as part of a team taking turns to lead up to 40 people in spontaneously narrated ‘yoga nidras’ – or deep relaxations. I first came because of a teacher of my own – the founder of the camp, radical feminist teacher and practitioner-scholar, Uma Dinsmore-Tuli. This year the camp will celebrate its tenth anniversary. Now I make time each summer to come and experiment with the wilder edge of British yoga teaching. This is where I catch up with a part-time, shifting nomadic tribe of yogis and yoginis at the edge of convention. Here is my first attempt to explore that event as fieldwork – to begin to understand what it is about this camp that is unique and therefore interesting; that which reflects other religious movements and is therefore relevant; and above all that which is an untold story within the mainstream discourse of yoga, in journalism, cultural awareness, scientific research or academic scholarship. This is not the yoga of lineage, although there are many with links to lineage here. This is not De Michelis’ definition of modern, secular, postural yoga, balancing as it does on the edges of sect and faith; lifestyle and science. Above all, this is not the yoga of brands, of commercialisation, even as it has links to transnational trends. In some ways it renews an older cultural response to late-stage capitalism. With its communal, libertarian social features, overtly political ethics and off-grid practicality, it is resonant with echoes of British counter-cultural history: from the free festivals of Stonehenge, to early ashram communes; from illegal raves to Teepee Valley. Many of the protagonists are veterans of those earlier cultural movements. A clutch of matriarchal figures preside over yogis and yoginis chopping vegetables and washing up. 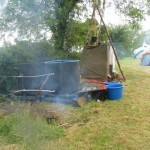 In another corner of the field, another dedicated crew heats water for bucket showers and stokes the wood-fired tiny sauna from dawn to dusk. Working for the basics of community life is more than expected, it is celebrated and even enjoyable. Four hours of such ‘karma yoga’ a day is expected from everyone, and although not everyone turns up for every shift, there are many hands for every job. Campers slip out of workshop sessions early to greet people on the gate, or sweep the sawdust from the toilets. As a teacher I timetable my offerings around my shifts in the kitchen. 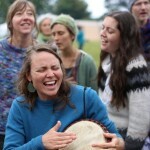 This is ‘seva’: defined as an act of love for the community; a recognition of interconnected ecology, strongly influenced by permaculture principles and engaged in for health and spiritual reward. The day begins early, in traditional ashram style: with chants and meditations. But here, the non-sectarian offerings multiply. The ‘Sat Nam’ dome resounds to Kundalini sadhana whilst the Bhakti Temple begins with Goddess chants, and others greet the sun barefoot in the dew with the camp’s own version of the ‘Dance of Life’. More chants are sung, and later risers choose between ‘heartspace meditation with Naz’, or ‘sensitive and strong yoga with Chris’; more Kundalini yoga or ‘informal family yoga with Anna’. Meanwhile, some of us early risers, too hungry to wait for breakfast, join Uma frying eggs and bread on the communal campfire. Tensions are quietly expressed through the food on offer: Kundalini purists argue for ‘high vibration’, raw salads and vegan stews; Womb yoginis talk about the perceived relationship of ovarian proteins to fertility issues; and worry about children getting enough protein. Everyone finds their comfort in the camp-run cafe selling chai and chocolate. Everyone still eats all together three times a day, in a big double circle with family, friends and strangers, under canvas or out in the sun. The altar in the Bhakti temple overflows with photos of gurus and murtis of gods. At the daily morning meeting to share the day’s schedule, every person present is welcomed by name, but few of the teachers declare allegiance to recognised schools. Most are influenced by a range of styles, and each other – we dip in and out of each others’ sessions; thanking each other, jostling discretely for favourite time-slots and larger spaces. Workshops are labelled with vague terms such as ‘gentle’ or ‘flowing’, or the names of obscure syncretic styles such as ‘Kashmir’ yoga. ‘Soma’ yoga is a ‘shamanically influenced’ movement as a shared trip. It draws one of the largest crowds of the camp. There are laughter yoga sessions and hybrid movement styles such as ‘Shakti Dance’. There are gong baths and crystal bowls; and Steiner-style arts and crafts and wilderness skills for the children. Still, there’s often a lone yogi or yogini to be found in some quiet corner doing their own practice too. It’s hard to determine the markers of faith or religious allegiance – even the devotional singers turn up to join in with each other’s offerings. Babaji followers straight from the ashram are joined by Amma devotees still bubbling from their last darshan. Choir leaders from the ‘Natural Voice Network’ lead the whole camp in gospels and African songs and Starhawk chants to honour the earth. Back in the Bhakti Temple Tim Chalice segues from a song based on a Rumi chant into ‘Hare Krishna’. Sub-cultural affiliations might show better in clothing, but it is difficult to read the signs – women in elegant bohemian linens roll out their mats alongside others in baggy jumpers and charity shop chic. Few of the big labels of yoga ‘fashion’ are in evidence. This isn’t the place to get your Lululemon or Sweaty Betty gear grubby. The occasional enthusiastic beginner in jeans is welcomed with ease. The entrance to each dome contains a tumble of exiled footwear, but although this might be a mark of entry into non-mundane space, it isn’t a sign of cleanliness as spiritual purity. The floor of the spaces are rough carpet or grass; and muddy soles are a badge of honour for those of us wandering barefoot. Within the round spaces of the domes, we teachers take our place in the centre, or at one randomly chosen edge – there is no obvious seat of honour, especially when a ‘student’ in one class is seen to be leading in another. Within the sessions, people wander in around the nominal start time, as we wait for a critical mass of students to begin. Entering late means finding a space in any orientation that will fit a yoga mat, sheepskin or blanket. Teachers are respected less for their instruction, and more as a source of inspiration. Students are often encouraged to adapt or modify the practices offered, and authenticity comes from personal resonance – the ‘heart’ as inner teacher. Most teachers rarely ‘correct’ students, and always with a smile. Teachers are prized most for their adaptability: their ability to teach to the moment, the space, the group and less overtly, the more-than-human environment. There’s a sense of radical acceptance here: radical in its intensity, and its philosophical, political justification. All weather is welcomed, as are all bodies, and most needs, but not all behaviours. ‘Santosa’ is a space of frugal hedonism or voluntary simplicity, where nurture is embraced, but not decadence – this is a strictly alcohol-free zone, for example. Sleepy campers stumble out of the last yoga nidra at 10.30 at night to a silent, mostly dark site, and are encouraged to keep things ‘shanti’ (peaceful, i.e. quiet) until the morning. But this is a camp that is safe for families, indulgent of children’s noise, and there is more diversity of bodies and capacities here than at most yoga events. Everywhere there are people moving, easing bodies, quietening minds, exploring senses. There is indeed an atmosphere of simplicity – phones are discretely used; the timetable shared via a blackboard. There is an ethos of self-nurture as an almost revolutionary act – our team of yoga nidra teachers runs a popular rolling schedule of five short but deep sessions a day. Ethical, ecological considerations are at the heart of many conversations. Thoreau, I feel, would have felt at home here: with this reverent return to Nature; debates on social justice, and discussions of ancient philosophy.